Targeting the Punjab CM, the Prime Minister said that Captain Singh did not attend the event because he was busy in the devotion of “Congress Parivar”. PM Modi added that he had never raised a question on the patriotism of the Punjab CM. Taking a dig at the Gandhi family, the PM stated, ”I can understand the kind of pressure which must have been put on Captain Singh for this kind of Parivar bhakti.” Udhampur Lok Sabha Constituency in Jammu & Kashmir: Candidates, Current MP, Polling Date And Election Results 2019. On April 13, accompanied by Punjab Chief Minister Captain Amarinder Singh and state minister Navjot Singh Sidhu, Rahul Gandhi paid floral tributes at the Jallianwala Bagh Memorial. "The cost of freedom must never ever be forgotten. We salute the people of India who gave everything they had for it. Jai Hind," Gandhi wrote in the visitors' book at the memorial. Meanwhile, India Vice-President M Venkaiah Naidu on Saturday released the commemorative postage stamp at the Jallianwala Bagh memorial on the commemoration of 100 years of the massacre. The Vice-President also released coins of Rs 100 with "Centenary of Jallianwala Bagh Massacre" written on it and the memorial drawn on it. The Prime Minister during the rally also slammed Congress for the Kashmir issue. PM Modi said that because of the Congress policies Kashmiri Pandits had to leave their homes. He targeted the grand old party for promising to reconsider AFSPA in Kashmir. Training guns at the National Conference and the People's Democratic Party, PM Modi said, "Abdullah family and Mufti family destroyed lives of three generations of J&K. The bright future of J&K can be ensured only after their departure. They can bring their entire clan into a field, can abuse Modi as much as they want but they won't be able to divide this nation." Kathua is part of Udhampur Lok Sabha constituency which is going for polls in the second phase on April 18. The BJP has fielded union minister and sitting MP Jitendra Singh from Udhampur, while the Congress has given a ticket to Vikramaditya Singh. Lok Sabha Elections 2019 Schedule: Voting In 7 Phases From April 11 to May 19, Counting And Results On May 23; Check All Dates For General Elections. 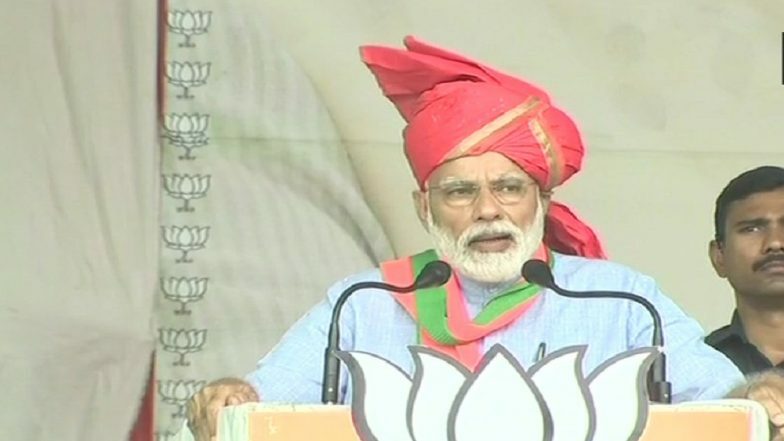 The Prime Minister also lauded voters of Baramulla and Jammu for coming in large number to vote in the first phase of Lok Sabha elections on April 11. The two seats in total recorded a voter turnout of 54.49 percent. Voting was held across 4489 polling booths spread across these two constituencies. Voting took place through Electronic Voting Machines, and VVPAT machines were also been placed at every polling booth.